In what is likely going to be the biggest event this month for longtime “CHiPs” fans, the complete fifth season of “CHiPs” is now available on DVD. 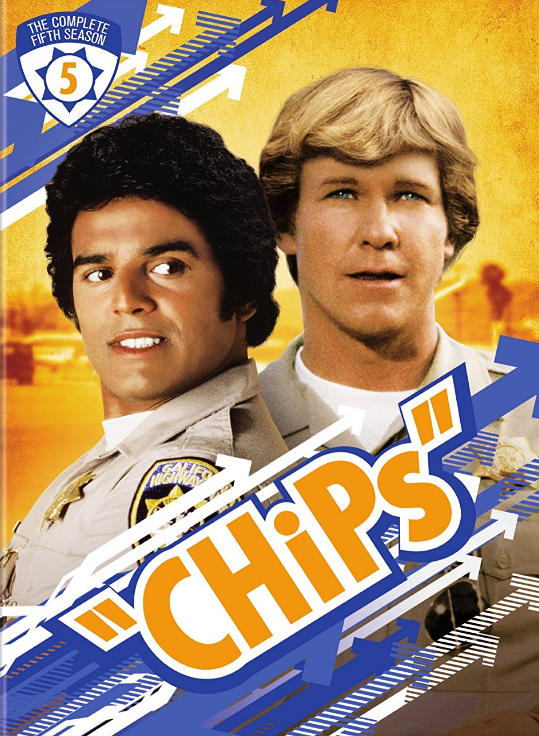 Erik Estrada and Larry Wilcox star in this high-speed series as California Highway Patrol officers Frank “Ponch” Poncharello and Jonathan “Jon” Baker, friends and partners who ride the Los Angeles freeways on their choppers chasing down criminals and, more often than not, sharing a few good-natured laughs. This season marks Wilcox’s last in the starring role of Jon — but there are still plenty of crimes to solve and adventures to be had! Like when a motorcycle star gets himself arrested before he can perform at a benefits show, so Jon decides to perform the stunts himself, or when Ponch moonlights as a technical advisor on an action-adventure film, but it isn’t long before the real action soon heats up. This season’s all-star guest star roster includes Ed Harris (Pollock, Apollo 13), Amy Madigan (Field of Dreams), Michael Dorn (Star Trek: Deep Space Nine), Jayne Kennedy, Anne Francis, Danny Bonaduce and more! The 5-disc DVD set includes all 27 episodes from the fifth season including two spin-off attempts (“Mitchell & Woods” and “Force Seven”), fan-favorite episodes like “Breaking Point” and “Battle of the Bands”, and Caitlyn Jenner (then known as Bruce Jenner) as Officer Steve McLeish in two episodes. Watch Ponch, Jon, Getraer, Baricza, Grossman, Turner, Clark, and Harlan as they keep the highways of Southern California safe for everyone! With a running time of 1,306 minutes, that’s plenty of “CHiPs” to keep you entertained for days!